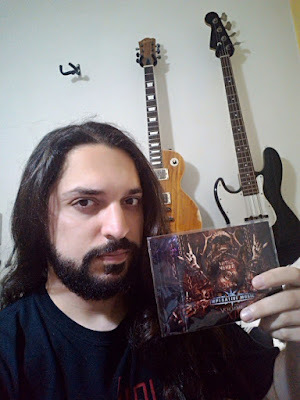 FABIO CARITO Bass prayer/Composer of WARREL DANE, INSTINCTED and sideman of RICARDO CONFESSORI (Ex-Angra/Shaman) commented the IMPERATIVE MUSIC Compilation. With great affection I received in my house this gift from my dear friend, and lover of good music, Gilson Rodrigues. There are 18 songs with bands from every corner of this planet, of various styles, and the first positive fact that I noticed was the amount of Brazilian bands, being present in one third of this compilation. Before placing the CD to rotate, it is impossible not to notice the graphic care that the work is made. I say this because both the Front-cover as the Back-cover is of a good taste amazing. Everything there was meticulously planned: Its colors, its layout, its typography. The disc flirts with various styles in Metal, but I realize that there is more space dedicated to Death and Thrash, that observation does not diminish the good performance that is contained in this record. All bands are in good level and are far from being considered newcomers. Some of them, in my view, should have a greater emphasis on their journeys. My predilections were with the bands: INFACT, AS DO THEY FALL, DEATH CHAOS, HIDE BOUND, METALIUM, EDUARDO LIRA and GODVLAD. Hopefully Volume 13 can maintain the high level it reached! 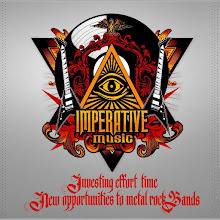 Imperative Music thanks the great support and words about this project and the bands involved, thank you very much dear friend Fabio Carito, we wish success to his musical career!!! Gilson de ARRUDA. * Bassist of the band WARREL DANE/Century Media Records (Nevermore/Sanctuary) from United States. * Bassist of Brazilian bands INSTINCTED and RICARDO CONFESSORI (Ex-Angra/Shaman). * Voted as one of the best Bass player in Brazil. * Engaged in several renowned bands.